...... 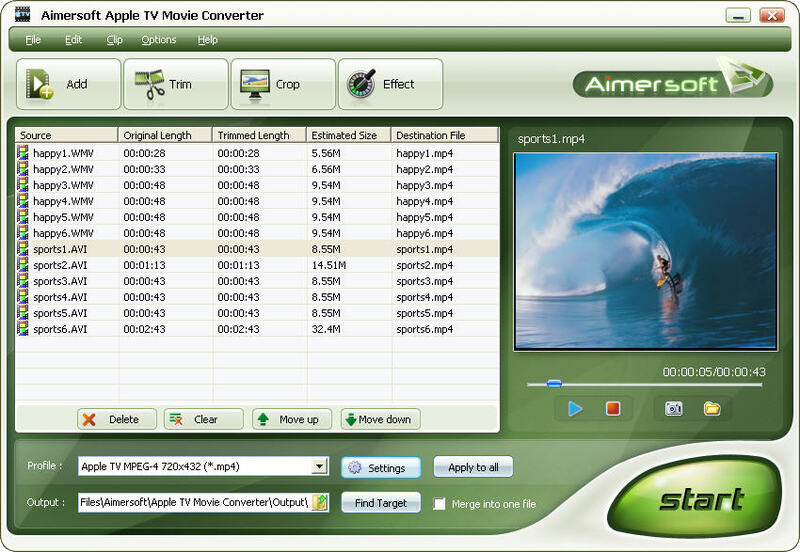 Besides these powerful functions, Aimersoft Apple TV Movie Converter also provides you a series of video editing function, you can crop the scene and trim the movie, adjust the video effect. 1. Support kinds of video formats: Apple TV Movie converter can convert all popular video formats including AVI, MPEG, WMV, MOV, MP4, RM, RMVB, DivX, ASF,3GP to Apple TV Video formats. 2. Powerful Video Editing: Allow you to adjust brightness, contrast, audio, etc. 4. Advanced technology makes the conversion so fast. 5. Support customizing output video file size and video quality. 6. Support various kinds of aspect ratio. e.g. 16:9, 4:3, full screen. 7. Support videos to MP3 and M4A audio conversion. 8. Automatically shut down your computer after conversion completed. 9. User-friendly UI, you can master it even it is the first time you use it. Qweas is providing links to Aimersoft Apple TV Movie Converter 2.2.0.4 as a courtesy, and makes no representations regarding Aimersoft Apple TV Movie Converter or any other applications or any information related thereto. Any questions, complaints or claims regarding this application Aimersoft Apple TV Movie Converter 2.2.0.4 must be directed to the appropriate software vendor. You may click the publisher link of Aimersoft Apple TV Movie Converter on the top of this page to get more details about the vendor.